Aluminum can be soldered with normal tin/lead solder for electronics provided the aluminum surface is sanded with a glass fiber brush, a stainless steel brush or sandpaper in order to remove the oxide layer. The point is, that it is almost impossible to solder aluminum with normal tin/lead solder because the brushed and cleaned surface oxidizes as soon it comes in contact with the air. Thats why you have to brush the surface under heatresistant motor oil. The oil protects the brushed surface from the oxygen in the air. Unlike in the movie, it’s even better when grinding under oil, so that the freshly cleaned surface will not come in contact with oxygene. 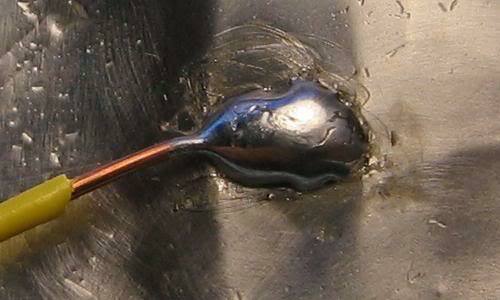 Before soldering, do not remove the oil completely. You can take any heatresistant oil. Any motor oil and even oil for automatic gear transmissions will do the job. It works better if you sand the aluminium surface with a drop of oil and a glass fibre pencil. Don´t wipe away the grey mud, which appears. It is important that the surface is always protected from oxidation by the oil. Then scratch with a hot soldering iron and some solder on the surface. It it not works probably the temperature is too low. Close-up of the solder joint on aluminum. You can see the scratch marks from a screwdriver. 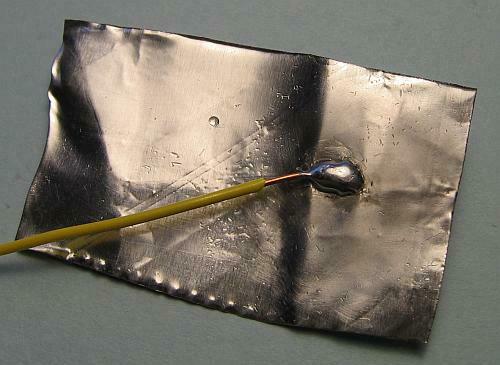 A soft solder joint on a thick aluminum foil. The trick with the engine oil has been known for many decades. Unlike shown in the movie, it would be even better to clean the surface in oil, since aluminum oxidizes rapidly in air. But I did not want to pollute my fiberglass brush with oil. According to other sources the motor oil can be replaced by paraffin oil. This method reveals new possibilties. Shieldings made of thick aluminum foil and aluminum heat sink plate can be soldered directly to the PCB.